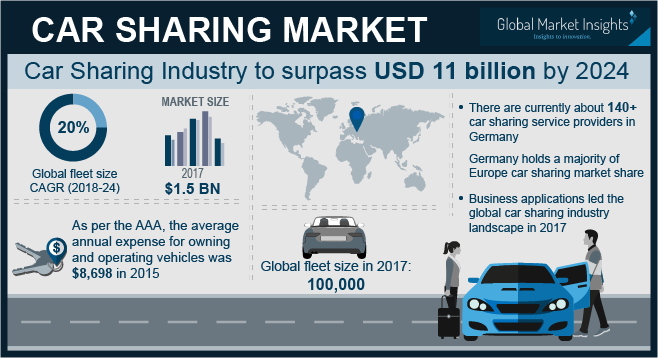 Car Sharing Market size is set to exceed USD 11 billion by 2024; according to a new research report by Global Market Insights, Inc. The global fleet size and number of members will grow at around 20% CAGR. Reduction in commuting costs is expected to propel the car sharing market growth over the next six years. According to the American Association of Automobiles (AAA), the average annual costs to own and operate vehicles are about USD 8,698. Car sharing model has the potential to significantly reduce the transportation costs for the commuters. According to the Transportation Sustainability Research Center, the monthly transportation savings for round trip car sharing members in the U.S. ranges from USD 154 to USD 435. Furthermore, car sharing addresses some of the traditional problems of owning a car including arranging and paying for parking spaces and maintaining the insurance cover. Stringent government regulations and norms associated with the emissions of greenhouse gases are propelling the growth of carsharing market. In January 2017, the government of Germany announced an initiative to encourage the adoption of these services by passing a draft bill to encourage the installation of the infrastructure required for these services. The government is helping the adopting of these services as these are considered crucial to make the transportation sector environmentally friendly. The absence of proper transportation infrastructure is posing a great challenge to the car sharing market. Poor road conditions in India, Turkey, and Africa are limiting the adoption of the car sharing model. Growing traffic congestion due to lack of road infrastructure is discouraging the users to opt for cars as a mode of transport. Moreover, limited parking on the street or in public garages is restraining the adoption of station-based car sharing platform. The use of advanced technologies is creating lucrative opportunities for the car sharing market growth. Industries are actively integrating technologically-advanced systems such as vehicle access and reservation systems into their vehicles to gain prominence in the carsharing market. The vehicle access system enables keyless entry whereas the reservation system allows the users to freeze their vehicles as per their time of need. For instance, Zipcar uses a zipcard as a vehicle access technique to unlock the doors of their vehicles and Enterprise CarShare uses a mobile app for reservation system to provide a selection of cars and the duration of usage for the customers. The adoption of such technologies will fuel the car sharing market growth. P2P carsharing market is expected to witness growth due to the increasing number of people willing to rent out their idle cars on a short-term basis. For the owner, car is an asset that incurs costs in the form of loan repayment, insurance, maintenance, depreciation, etc. The owners are becoming increasingly inclined toward earning money by renting it out rather than letting the car sit idle in the parking lot. Round trip car sharing market is projected to undergo wide adoption due to the lower costs for long-distance trips as the fares are based on distance traveled. The model allows a user to pick and return a shared vehicle at the same station that is supported by mobile applications or a personal access card. Growing awareness related to environmental benefits of these services, such as reduction in carbon emissions, will further increase the adoption of round trip services over the coming years. The U.S. carsharing market is projected to grow due to the incentives introduced by the government to promote the use of these services. The states in the country have enacted taxation regulations & legislation and incentives for companies providing these services. For instance, the state of Washington has announced tax credits of up to USD 60 per employee per year to the employers that offer these services to the employees. Various public transit agencies such as Los Angeles County Metropolitan Transportation Authority, Dallas Area Rapid Transit, Tri-County Metropolitan Transportation District of Oregon, Metropolitan Atlanta Rapid Transit Authority, and Massachusetts Bay Transportation Authority have formed partnerships with car sharing companies to locate car sharing vehicles near transit stations. The aim is to create a mobility hub for the commuters, thus propelling the car sharing market growth. Some of the players in the car sharing market include Orix Corporation, Lyft, Inc. Locomute (Pty) Ltd., Ekar Fz LLC, Carrotshare, and Hour Car. Strategic acquisitions and partnerships are the strategies commonly adopted by the players. For instance, in January 2017, Europcar Group announced the acquisition of GuidaMi, a station-based car sharing company to expand its business in Milan. In November 2016, Getaround acquired stakes of City CarShare to strengthen its position in the market.